Wollongong Hospital developed electronic scheduling systems, patient education materials and a clinical review process, to reduce wait times in its Endoscopy Unit. To increase clinical review of request for admission (RFA) forms from 26 per cent 100 per cent by December 2017. To reduce wait times for an endoscopy clinic appointment from six months to three months by January 2018. To improve communication of appointments, procedures and processes to 100 per cent of endoscopy patients by March 2018. Reduces wait times for people who require an endoscopy procedure. Increases access to specialist consultations to meet patient demand. Reduces unplanned cancellations of clinic appointments and procedures. Improves the efficiency of endoscopy lists and clinician time. Improves patient communication, experience and health care journey. Provides a coordinated and client-centred approach to service delivery. Reduces healthcare costs associated with delivering endoscopy services. 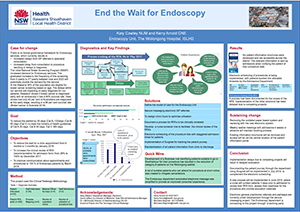 In March 2016, an external review of the Endoscopy Unit at Wollongong Hospital was undertaken, following anecdotal feedback from staff about the significant increase in the number of patients on the wait list and the length of time they were required to wait for a specialist consultation. At the time, there were 778 patients on the wait list and the wait time for a consultation was between six weeks and six months. In addition, wait time for each category was over the recommended time frame1: Category A was 56 days (target 30 days); Category B was 210 days (target 90 days); and Category C was 425 days (target 365 days). The delays to consultation, diagnosis and treatment caused by the extended wait list at Wollongong Hospital had the potential to not only impact the survival rate of patients, but also their health care experience. Following the external review, a number of key issues were identified. The endoscopy clinic could not provide enough appointments to meet the demand for specialist consultations, partly due to an outdated scheduling system. Many patients were not showing up to their appointments, resulting in an inefficient use of limited resources. There was no formal process for reviewing the RFA form, which resulted in cancellations on the day of procedure. Only 67 per cent of RFA forms were filled in correctly, with many getting lost, not arriving at the Admissions Department and not dated in a timely manner. There was inadequate communication to patients, with surveys revealing that many patients felt they did not have enough information to prepare for their procedure. Written information provided to patients was outdated and verbal instructions often varied between departments. The endoscopy procedure list was underutilised, due to time scheduled for emergency cases, outdated scheduling processes and unplanned cancellations. Patient information about the preparation required and what to expect on the day of the procedure was revised and standardised. This information is now available on the patient information portal and can be distributed across the local health district. A process was developed in consultation with the Admissions Department about providing information to patients. The relevant information is now sent with the letter, notifying the patient of their procedure date. A business rule was developed to send Category B patients to Shellharbour Hospital for endoscopy procedures. This was implemented to help reduce the Wollongong wait list for endoscopy procedures. A business rule was developed to identify patients who are suitable to attend at short notice to cover unplanned cancellations. Documenting the patient’s journey through the department using SurgiNet will be implemented in June 2018, to complement electronic scheduling. A new process will be implemented, where a nurse will contact patients one week prior to admission to review their RFA form, assess their readiness for the procedure and provide education materials. Other solutions, such as an electronic wait list system and electronic general practitioner referrals are currently in development. a staff survey to measure satisfaction with the new processes. Sponsorship support and management buy-in is crucial to the success of the project. Competing projects are a major risk to the timely progression of any project. Key stakeholders need to be involved at every stage to achieve the desired outcomes. NSW Ministry of Health. Waiting Time and Elective Surgery Policy. North Sydney, NSW: NSW Health; 2012. Australian Government. Bowel cancer (colorectal cancer) in Australia. Sydney, NSW: Cancer Australia; 2018. NSW Ministry of Health. The Perioperative Toolkit GL2018_004. North Sydney, NSW: NSW Health; 2018.